Washington (AFP) – Democrats intend to probe US President Donald Trump’s financial ties to determine whether they are the “hidden hand” driving US foreign policy on Russia and Saudi Arabia, the incoming chairman of the House Intelligence Committee said Sunday. Adam Schiff, currently the ranking Democrat on that committee, accused Trump of being “dishonest” about the role of Saudi Crown Prince Mohammed bin Salman in the murder of journalist Jamal Khashoggi. A Republican senator privy to the intelligence also challenged Trump’s denial this week that the CIA had concluded that the crown prince ordered the October 2 assassination. The Saudis, who changed their version of events as evidence was made public in Turkey, have insisted that Prince Mohammed had no prior knowledge of the assassination — an interpretation which Trump has accepted. Democrats, including Schiff, will have power of subpoena to pursue questions about the CIA’s findings as well as about Trump’s financial ties when they assume leadership of the House in January. Schiff declined to comment on a report that the committee is recruiting money-laundering and forensic accounting experts in preparation for those probes. Featured Photo: AFP/File / MANDEL NGAN. 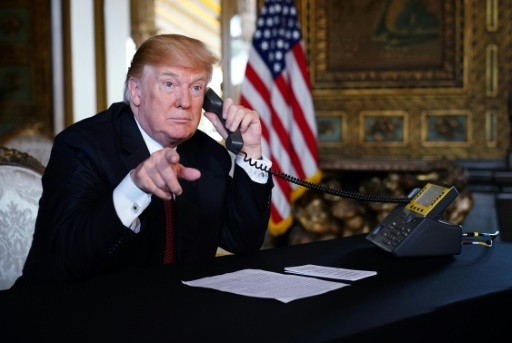 US President Donald Trump speaks to members of the military via teleconference from his Mar-a-Lago resort in Palm Beach, Florida, on Thanksgiving Day, November 22, 2018.